Thank you so much to everyone who voted for us in this year’s Rezzie Awards! 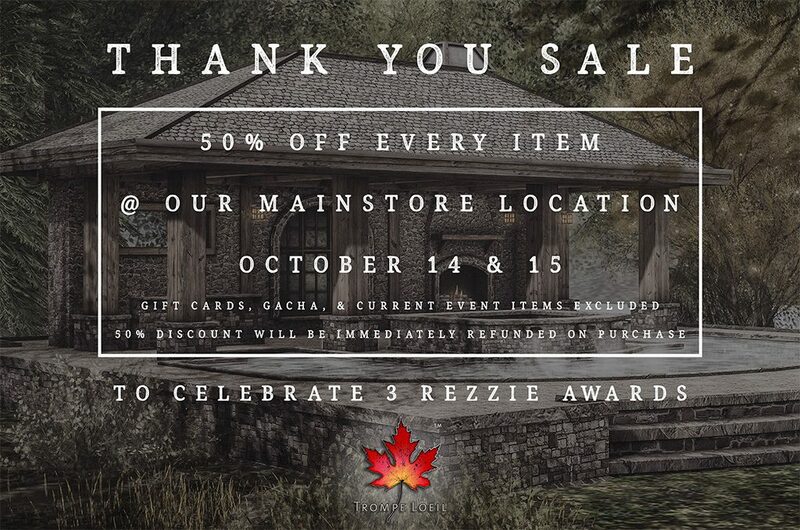 To celebrate our 3 wins (Best Outdoor Structures, Best Prefab Houses, Best Customer Service), everything at our Mainstore location is 50% off this weekend only! Come on by and celebrate with us! ** 50% refund is given automatically after purchase of full-price item. List prices remain the same, but you will be immediately refunded 50% of the list price. ** Current event items, gacha machines, Marketplace purchases, and gift cards are excluded. ** Due to vendor limitations, gift card purchases cannot be refunded the 50% discount.